Nochebuena or Christmas Eve is one of most important holidays in Latin America. Most people go to la misa del gallo or midnight mass and then have a huge family dinner after mass. The traditional Christmas Eve dinner usually includes turkey and/or pork, as well many side dishes and desserts. 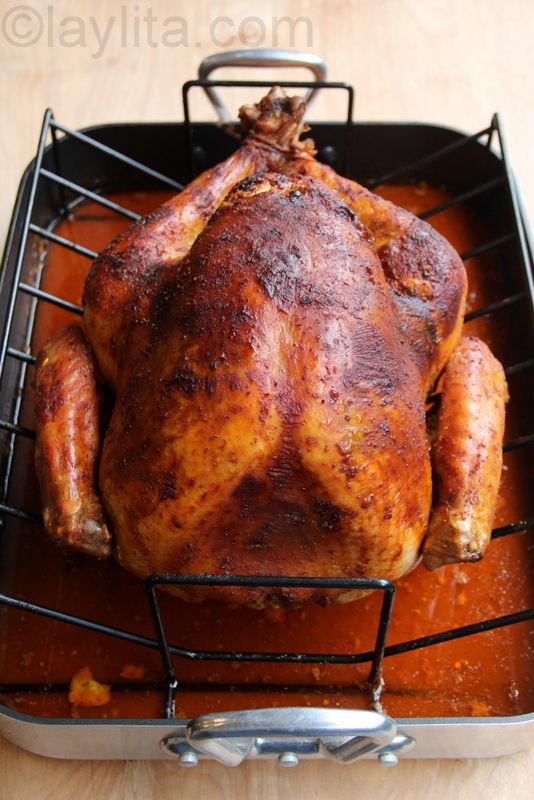 My Christmas turkey is prepared criollo style with a marinade of garlic, cumin, achiote or annatto and chicha. Chicha is a fermented corn drink that is very popular in the Andes. In the US, you can find chicha n some of the Latin grocery stores; you can use beer as a replacement if you can’t find chicha. I have become addicted to marinating and cooking meat, from chicken to pork, with chicha. My inspiration for roasting the turkey this way comes from another classic Ecuadorian dish that is also a Christmas favorite: hornado de chancho or roasted pork leg. 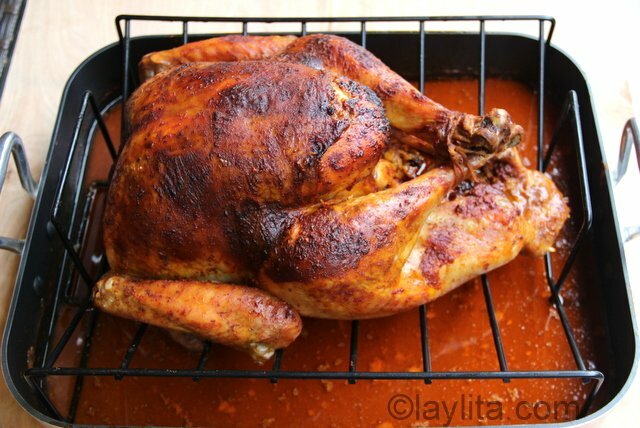 Pavo navideño o roasted turkey for Nochebuena or Christmas Eve dinner, marinated in garlic, cumin, achiote and chicha or beer. Rinse the turkey with cold water and pat dry. Tuck the wings underneath the turkey and tie the drumsticks together using cooking twine. 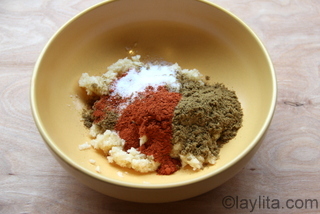 To prepare the marinade, mix the crushed garlic, cumin, achiote and salt. Rub the turkey with the marinade, both inside and out. 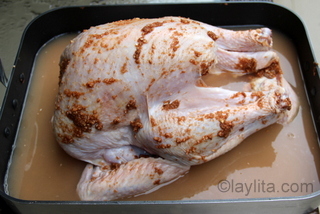 Pour the chicha or beer over the turkey, some of the garlic marinade will fall off the skin, so rub it back on the skin. Let the turkey marinate overnight in the refrigerator. Put the turkey in a large baking pan on a roasting rack. 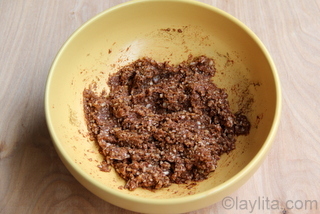 Mix the butter, achiote and salt until you have a smooth mix. Rub the achiote butter inside turkey cavities and use your hand to gently lift the skin of the turkey, and then stuff it with the butter. 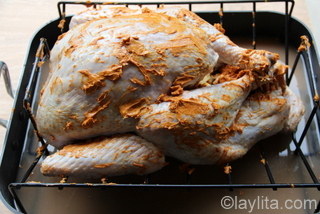 Also rub some butter on the exterior skin of the turkey. Fill the inside of the turkey with the stuffing, if desired. Stuffing can also be baked separately. 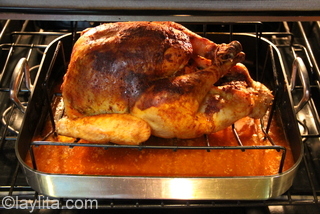 Bake the turkey at 425F for 30 minutes; use a ladle to spoon the liquid over the turkey. Lower the temperature to 375F and bake for another 1 ½ hours, to help keep the turkey moist pour a ladleful of the pan sauces over the turkey about every 30 minutes. Lower the temperature to 350F, cover the turkey with foil and bake for another 1 - 1 ½ hrs or until the internal temperature of the turkey, in the thigh, is 165F. If baking stuffing inside the turkey the temperature of the stuffing should also be 165F. If the turkey is stuffed it will take longer to be done than if the turkey is unstuffed. 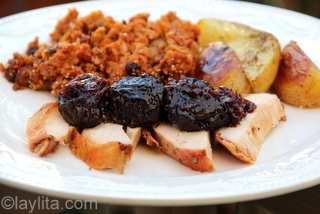 Serve the turkey with the holiday stuffing, salsa de ciruelas or prune sauce, and your choice of side dishes. In Ecuador, most people usually used manteca de chancho or lard as their favorite choice of grease. I love cooking with lard, but feel that it can overpower the taste of the turkey and I have some close friends who don’t eat pork. As a result I used butter instead of lard for this recipe, however if you are a fan of lard, then feel free to use it. 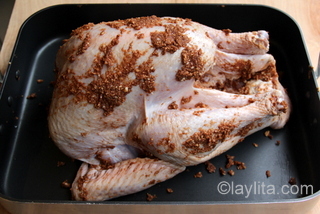 The butter (or lard) is an important ingredient when roasting turkey as it helps keep the meat moist. Another strategy that I borrowed from the hornado de chancho preparation to keep the turkey moist is to use the pan juices to “bañar” or bathe the turkey, this is done every 30 minutes or so while the turkey is baking. The turkey can be baked filled with the traditional Christmas relleno or stuffing, keep in mind that if you bake the turkey stuffed it will likely need additional time to bake. I recommend using a meat thermometer to check the temperature of both the meat and the stuffing; both should be at 165F to be fully cooked. The turkey can actually be removed from the oven when it’s around 155F-160F, as it will continue to cook for a little even after removed from the oven. For the Christmas Eve meal, the turkey should be served with the sweet and savory stuffing and a sweet salsa de ciruelas or prune sauce. This recipe can also be made with chicken instead of turkey, reduce the marinade by half, and bake for about 1 – 1 ½ hr (depending on the size of the chicken). Laylita, I didn’t know you are Ecuadorian! My brother told me he looks at your recipes so now I do too. Can’t wait to do the turkey with lots of garlic, cumin and achiote. I am looking forward to your recipe book. From one Ecuadorian to another, thank you. Hi Claudia – I use regular salt, but you can also use Kosher salt (just add a bit more to compensate). The garlic cloves are for the marinade, most of which ends up in the sauce, but feel free to add less if you are not a garlic fan. I’m not sure what chicha is, but if I substituted beer, what kind would you suggest? I’ve used a variety of different beers, including: Stella, Asahi, Corona, and Heineken. For those that do not know what is Chicha, it is a drink no different than beer, but its ingredients are quite different, and it is an alcoholic or non alcoholic beverage depending if it is fermented or not. It can be made of fruits, cassava o grains. The cassava version is the most famous one. I was sure that the corn one, called chicha de jora, is the most well-known one. At least that’s the case in the Andean regions. Great looking recipe, can’t wait to try this. I have a liquid form of Achiote that i bought online as its an ingredient that’s not readily available in the UK. Any ideas how much of this i would use? Hi Lisa – It depends how concentrated the liquid achiote is, if it’s very strong (both in flavor and color) then I would use half of the amount I used in powdered form, if it’s not so concentrated then the same amount or a little bit more. Cuanto recuerdos con este post Laylita. La misa de gallo, el pavo…me has dejado en la nostalgia! No sabía que en Ecuador también usan el achiote. Gran descubrimiento, yo pienso preparar una piernita de cerdo en achiote para nuestra celebración navideña. Heidi – Si, esta epoca siempre trae nostalgia cuando se esta lejos! El achiote se usa para todo en Ecuador, es esencial para muchos de nuestros platos tipicos. Feliz Navidad y Prospero Año Nuevo! Looks delicious! 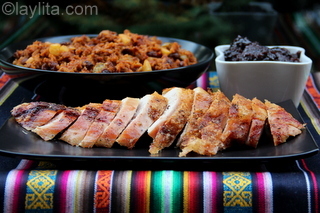 Similar in some ways to the Peruvian Turkey. Do most have ovens in their homes to make these meals? Interesting that they use prunes – here there is a lot of raisins in the stuffing. Raisins and chorizo. Hope you have a Merry Christmas! 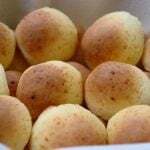 Hi Gretchen – It’s true that not everyone has an oven (and when renting a place in Ecuador during the summer the oven was quite small), but many people do, especially in the cities. Since families get together for Christmas there’s usually someone who has an oven. Also, quite a few people tend to buy the turkey, stuffing and sauce from restaurants or individuals that prepare them in bulk. I am guessing that the use of prunes is from the Spanish colonial days. Have a wonderful Christmas! Thank you for bringing back so many memories of my mom’s cooking….which; I , as a typical male of Spanish-south American heritage ,did not pay attention and now i regret it. 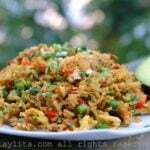 By the way i got the owner of the spice store in Princeton N.J. to cook your yapingachos… he absolutely loved it. Hello..i want to try to make this. Are you using Chicha Morada or Chicha de Joe’s? Also, in the past years I’ve found that some dry hard apple ciders are very similar to the flavor of chicha and make a decent replacement for chicha in savory recipes.